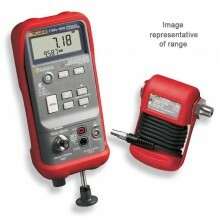 Includes: 719 PRO Electric Pressure Calibrator,Test leads with alligator clips, Printed user's manual and user's manual on CD-ROM in 14 languages, Fluid trap, Carrying case, 1/4 inch NPT to 1/4 inch ISO adapter, Accessory hose kit with (2) 1/8 inch quick fit adapters and 1 meter of hose, Traceable Certificate of Calibration. 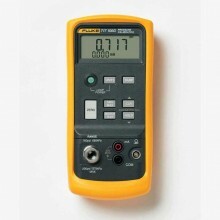 The Fluke 719PRO Pressure Calibrator is a simple to use and versatile pressure calibrator. 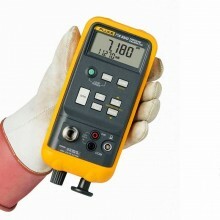 Its internal pressure sensor and innovative electrically-powered pump reach higher pressures and let the 719 Pro calibrate virtually any pressure device. 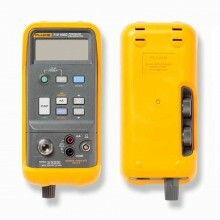 It features inputs for mA, voltage, switch contacts, and an RTD probe. 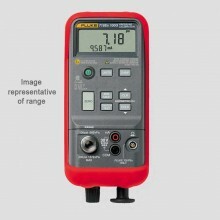 An external-pressure module option gives a wider range of pressure calibration options that include absolute and differential. psi, bar, mbar, kPa, kgcm2, cmH2O@4 °C, cmH2O@20 °C, mH2O@4 °C, mH2O@20 °C, inH2O@4 °C, inH2O@20 °C, inH2O@60 °F, mmHg@0 °C, inHg@0 °C, ftH2O@4 °C, ftH2O@20 °C, ftH2O@60 °F. 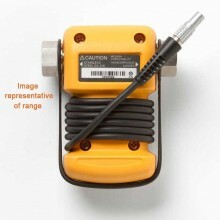 Unique integrated electric pump for one handed pressure calibration. 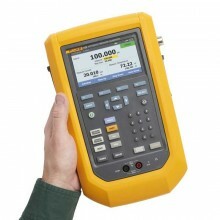 Test pressure switches easily with easy-to-use switch test function. 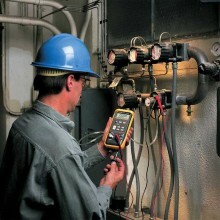 Precision pressure adjust vernier for easy and accurate pressure calibration. 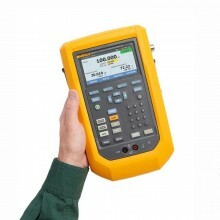 Ideal accuracy and performance (0.025 %) for reference class transmitter calibration. Allows the user to program target pressures for pumping. 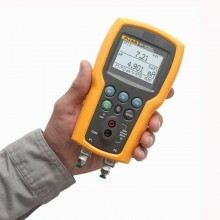 Extended pressure measurement range with any of 29 700Pxx Pressure Modules. Pump cleanout ports reduce pump failures from moisture and fluid damage. 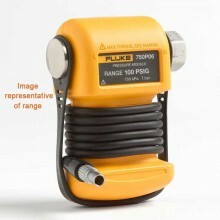 Fluid trap included with the unit to mitigate chance of fluid damage in at-risk applications. 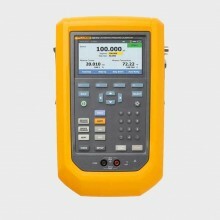 Precision temperature measurement with optional RTD probe. 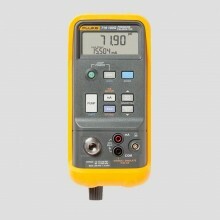 Fluke-719Pro-30G Range -12 to 30 psi / -0.8 to 2 bar. Resolution 0.001 psi / 0.0001 bar. 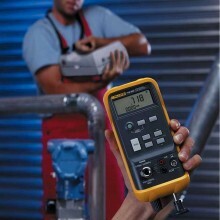 Fluke-719Pro-150G Range -12 to 150 psi / -0.8 to 10 bar. Resolution 0.01 psi / 0.001 bar. 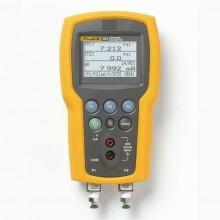 Fluke-719Pro-300G Range -12 to 300 psi / -0.8 to 20 bar. ±0.035% of full scale, 1 year. Temperature effect (all ranges) Add ±0.002% F.S./°C for temps outside of 15°C to 35°C. 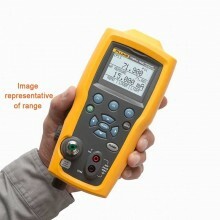 No effect on accuracy on all functions from 15°C to 35°C. Function Range Resolution Accuracy (1 year). 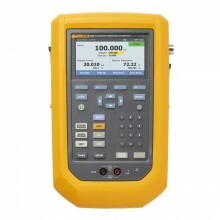 mA DC (simulation and measurement) 0-24 mA DC 0.001 mA ±0.015% of reading ±2 counts. 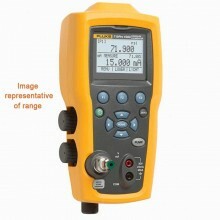 1000 ohm maximum load in mA source, 26 V DC maximum voltage in mA simulate. 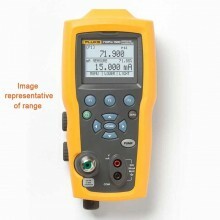 Volts DC (measurement only) 30 V DC 0.001 V ±0.015% of reading ±2 counts. 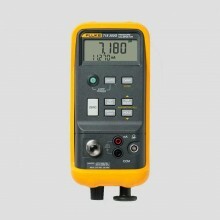 No AC voltage measurement, do not exceed 30 V DC. ±0.25°C (±0.45°F) combined uncertainty when using 720 RTD probe (optional accessory). Loop power supply 24 V DC N/A 24 mA at 24 V.
Temperature effect (all functions) - - Add ±0.002% F.S./°C for temps outside of 15°C to 35°C. Storage temperature (with batteries) Per battery manufacturer's specification within storage specification below. Storage temperature (without batteries) -20°C to +60°C. 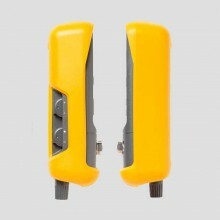 Battery Eight (8) standard Alkaline AA batteries. Battery life 300 pump cycles to 150 psi minimum; 1000 pump cycles to 30 psi; 100 pump cycles to 300 psi minimum. Dimensions (H x W x D) 24.13 x 11.18 x 7 cm (9.5 x 4.4 x 2.8 in). Weight With holster 1.2 kg (2.5 lb). Pressure 1/8 inch female NPT. RTD 4 pin miniature circular. External module 6 pin miniature circular. psi, bar, mbar, kPa, kgcm2, cmH2O @ 4°C, cmH2O @ 20°C, mH2O @ 4°C, mH2O @ 20°C, inH2O @ 4°C, inH2O @ 20°C, inH2O @ 60°F, mmHg @ 0°C, inHg @ 0°C, ftH2O @ 4°C, ftH2O @ 20°C, ftH2O @ 60°F. 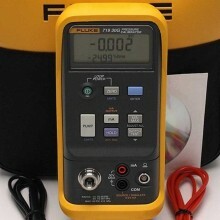 PDF Specifications of the Fluke 719Pro Electric Pressure Calibrator.